Underneath Zeah lies a vast set of catacombs. Distorted by the dark altar and overrun by all kinds of creatures, these catacombs are no place for every day adventurers. The Catacombs of Kourend is a great location to take on some of your favourite monsters to kill, as well as a whole host of previously unseen creatures. The Catacombs of Kourend can be entered by using the 'Investigate' option on the statue found in the center of the city. After investigating the statue, you will find yourself in the center of a winding set of tunnels. Throughout the tunnel there are four additional entrances/exits which can be unlocked by using each of them once from within the catacombs. Within the catacombs there are a great deal of familiar monsters for you to take on. Although, not all of the creatures found within will be ones you have encountered on your past adventures. Many monsters living in the catacombs have had their very nature changed by the power of the dark altar, spawning new, horrifying and powerful breeds. These unnatural creatures are still similar in nature to their more common counterparts, however they will put up more of a fight and provide more lucrative rewards for killing them. 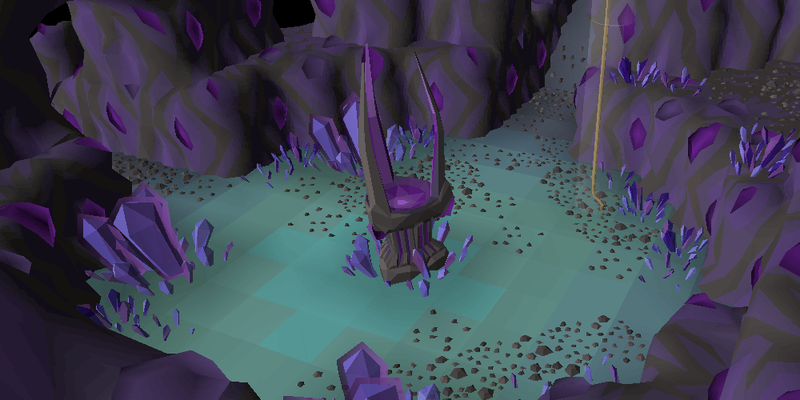 On your adventures throughout the Catacombs of Kourend, you may be fortunate enough to receive an ancient shard drop. Three ancient shards can be used to transform the Darklight into the Arclight - an astoundingly powerful demon slaying weapon which provides stats superior to the abyssal tentacle when used against demons. For every three ancient shards used to charge the Arclight, the weapon will gain 1,000 charges. One charge is degraded every time you attack with the weapon. Any excess shards which you get your hands on can be used on the altar found at the center of the catacombs for quick transportation around the area. Delving deeper into the catacombs is not something wise adventurers do. Although, those seeking glory may put wisdom aside to go down in the history books. In order to gain access to the furthest depths of the catacombs you must first gather enough dark totem pieces to create a dark totem used for one-time access to the lower catacombs. Beneath the Catacombs lies a treacherous creature which has been engulfed and distorted by the ever-flowing energy of the dark altar. With next week's update, you will have a chance to choose wisdom or glory and decide if you will take on the beast beneath. An axe store has opened for business within the woodcutting guild. Added a bank deposit box to the woodcutting guild bank. The woodcutting guild now provides a hidden +7 woodcutting boost. The Massacre sound track is no longer available. Switching protected skills on Deadman mode is now protected by your bank pin. Added level up messages for Redwood to the firemaking and woodcutting skill guides. The Kourend task overlay is now available within the woodcutting guild. Corrected some capitalization in the Lumbridge cook's dialogue. Added gender specific titles to Advisor Ghrim's dialogue during Throne of Miscellania. Corrected the spelling of parasitic in the Abyssal Nexus. Corrected a typo in a message related to the silvthrill rod. Added zenyte, abyssal weapons and the dragon warhammer to the GE salesman item lists. Corrected a typo when redirecting the blood and soul portals within the abyss. Corrected the height of the player when crossing the monkey bars in Kruk's lair. Examining items shown in the death interface on Deadman mode now displays the correct information for the item examined. You can no longer dig for sandgrubs without the requirements by manually digging with a spade. 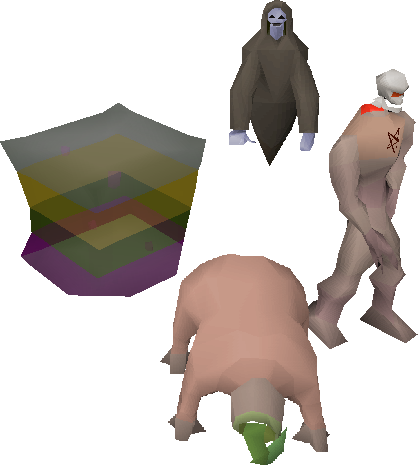 Several object interactions have had delays removed from their script, or have been restricted from being used in the duel arena. You can now call pets that are close to you, but are trapped. 4 rogue push tiles have been removed from the Hosidius area. You will now find that game messages relating to pickpocketing elves are now filtered. "You're stunned" should now be filtered too. Pickpocketing elves should also now correctly receive the 10% buff to your chances of successfully pickpocketing with the hard Ardougne diary. Good stuff, let's hope the people that don't cannon actually go there..
can you kill the new monsters without having task? Can't wait to try out the new Catacombs! 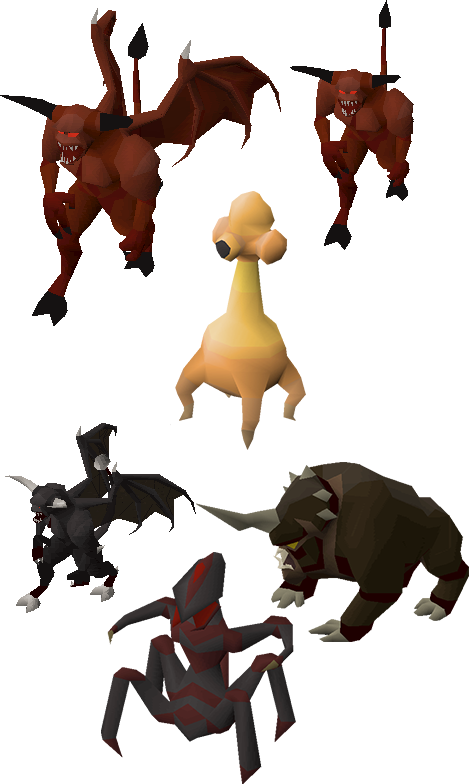 One thing I am wondering though, is if they have any other drops/different slayer xp value different to their mainland counterparts? Beyond those that were mentioned earlier, like the thingys to enter the Boss Room.